Report Card went home last week. Please make sure the signed report card slips are returned A.S.A.P. We are also looking for things to give out as rewards to students. We would love donations of things like candy, pencils, other school supplies, stickers, ect. 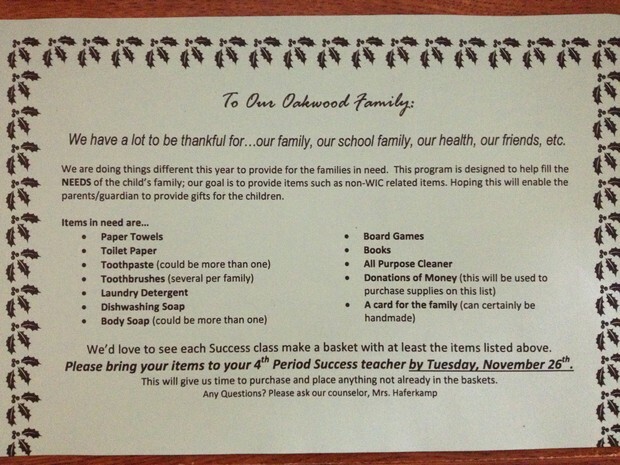 If you have anything you can donate please have your student take donations to their success teacher. All students will present research projects in class today and tomorrow. Advanced classes need to remember to bring a prop or costume for the presentation. The rest of the week will be dedicated to group research projects. All students will be taking a Math CBM today and tomorrow during success classes. We will begin mini-society this week. Parents/guardians who are not familiar with mini-society are encouraged to go to my website and read the letter linked on my web page. We will have a quiz over our mini-society vocabulary next Monday.